A wine bottle sits in a basket among old books on a quilt in a field in Newburyport. Vintage Engagement Photos, Check! Heather put every detail you see here in motion. She had the quilt from a family heirloom. 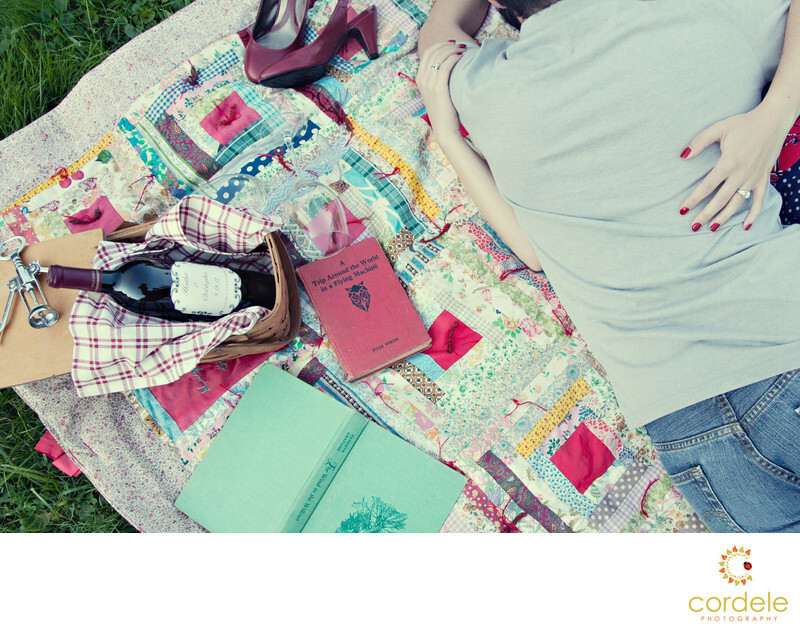 I think the vintage books really make the photo as well as the mystery of not seeing the couples face in the photo. I love the faded colors of the photo to help set the mode. It's not an action I use on a lot of photos, although, when it works, it works. Heather and Chris have been my friends for a long time. When Chris was in college at UMass with me, he introduced me to my now husband Seth. I was so excited when he asked me to shoot his engagement photos with his wife to be. Heather has a Martha Stewart Gene that she pulls out every once and awhile. She pulled this entire engagement shoot together and the details were flawless. She found the books, the basket and the blanket. I believe the blanket was a quilt her mom made. I love this photo because it gives the hint of love without having to actually see their faces. This has to be one of my favorite engagement photos I have ever taken. Heather and Chris ended up getting married up in New Hampshire at a cute barn and the photos were just as beautiful up there! I was not able to shoot the wedding, but the details Heather put in where amazing. The funny thing about this shoot, is after it, I got a parking ticket. I didn't realize you had to pay to go to this park (who knew!). Location: Maudsley State Park 74 Curzon Mill Rd, Newburyport, MA 01950.